Yesterday, as I was searching for descriptions of San Francisco Theaters in 1880 (I am hoping to have a scene in a theater in my next historical mystery, Bloody Lessons), I ran across the following paragraph and laughed out loud. You see, I am a fan of the movie the Big Lebowski, whose main character called himself “The Dude” and spoke of himself in the third person, and, as a result, the use of the word dude in this 19th century context cracked me up. The next thing that occurred to me is that if I tried to use the word dude in my 19th century fiction, I would probably bring the reader right out of the moment because it would sound so modern. As I investigated the word and its meanings, I discovered that the term has undergone a profound transformation from its 19th century origins to its modern-day uses. In 1883, when the above paragraph was written, the term dude was very new. A history of the word in Wikipedia says that the word first appeared in print in the 1870s in Putnam’s Magazine, making fun of how a woman dressed. However, a variety of sources, including the Merriam-Webster Dictionary, agree that by the 1880s it had become American slang for “a man extremely fastidious in dress and manner,” often suggesting that they were aping the style of the English upper classes. In other words, dude meant a dandy. While most sources agreed that the first printed use of the term with this meaning was 1883, obviously three years later the humorist complaining about modern mores felt comfortable that his readers would understand his use of dude when describing the rude young man who was strolling down a San Francisco street, twirling his cane. 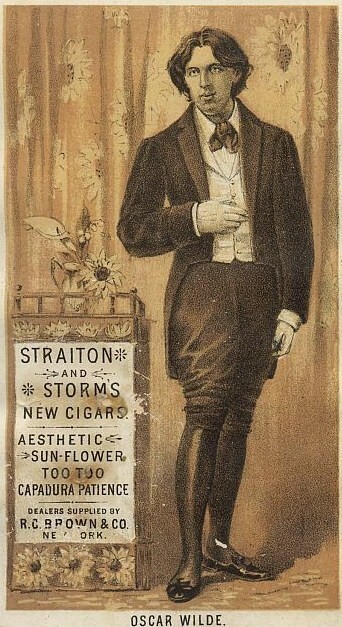 I am inserting a picture of Oscar Wilde, who was considered the personification of a dandy, from his 1882 tour. At the exact same time, the word was taking on another, albeit related, meaning, as the term dude began to be used (for the first time in 1883 in the Home and Farm Manual) to describe men from the city (Easterners) who demonstrated their lack of knowledge about rural life (the West) by behaving and dressing inappropriately. These two uses of the term were clearly related since to a working rancher or farmer there would be nothing more ridiculous than some dude (whether from an eastern or a european city), who came to the American West, dressed in fancy duds and pretending to be a cowboy. Yet, by the late sixties the term had also become a general form of slang used by men when addressing other men, and it seemed to have emerged within urban Black culture. As a young adult in the late sixties (who spent the summer of 1968 taking classes and living in a dorm at the traditionally all black college, Howard University, and then spent a good deal of time the next two years hanging out with my future husband who lived in the primarily African-American male dormitory at Oberlin College) I had become used to African-American men referring to each other as dude. Unlike its original meanings, this was a positive form of address, and it had nothing to do with city slickers. Pretty quickly, whites who wanted to sound cool, expropriated the term (it shows up in the movie, Easy Rider) and by the mid-to-late 1970s, just about the time I arrived in Southern California, the term became associated with that region, specifically attributed to “stoners, surfers, and skateboarders.” See the Urban Slang Dictionary. Robert Lane who has written a piece on the word, points out that int 1982 Sean Penn’s character, Jeff Spicoli, in the movie Fast Times at Ridgemont High, personified the kind of young man who was called, and called others, dude. While this new use of dude, as an informal form of address among young people, began to predominate, the older meanings didn’t fade away completely. My young daughter, for example, loved the TV show Hey Dude (1989-1991) that was about a dude ranch, not stoner skateboarders. Nevertheless, in my own mind, this earlier meaning of the word was wiped out completely after I watched Jeff Bridges in the Big Lebowski in 1998. This movie about a grown up man, Jeff Lebowski, whose days are filled with bowling, smoking weed, and sliding through life, has become a cult favorite, and it has created an indelible image of what could happen to the Spicolis of the world if they never grew up. What does this all mean for me as a writer of historical fiction set in the 1880s? First of all, I can’t prove that any of my characters would use the word dude, in either of the earlier meanings–of dandy or city slicker–in 1880, when my next book is set, since I can’t prove they would have heard of it that early. However, the fact that the writer of the 1886 quote used the word without feeling the need of any explanation does suggest that I would not be committing any major historical inaccuracy if I did have someone use the word in either of its original meanings. Yet, when I read the word yesterday, all I could think of was Jeff Lebowski, in his ancient knitted cardigan, sloppy t-shirt, and baggy bermuda shorts, ambling down the street with his bowling bag in hand, and I was no longer in the 19th century, and I was certainly not thinking about a young man who was “extremely fastidious in dress and manner.” Here the modern meaning and use of the term was just too far from its origins to be an effective word to use in a work of historical fiction set in 1880. Consequently, it was with reluctance I gave up trying to figure out in what context one of my characters could call another Dude. But I did have fun exploring the origins of the word, and I hope you had fun reading about it. Furthermore, I recommend that you click on this link and read the rest of Silver Pen’s 1886 diatribe on Etiquette on the Street because I think it will make you laugh, even if you aren’t a Big Lebowski fan. The Stranger: The Dude abides. I don’t know about you but I take comfort in that. It’s good knowin’ he’s out there. The Dude. Takin’ ‘er easy for all us sinners. Absolutely fascinating, but you’re right – the term is now at the epidemic stage, a clan marker for the young and with it that has permeated American English. Teenage girls even call each other “dude”! Having a Victorian character use the word, despite its authenticity, would only trigger the contemporary reaction. Jeff Bridges was just on the Charlie Rose show on Wednesday night and they talked about “the Dude” with a Zen Master. To find him mentioned again in your blog was a surprise. You might find the interview interesting because the meaning is still evolving. I’m sure you can find it on Charlie’s website. I am glad you will not use the term “dude” for your novel, because it would certainly bring to mind the modern connotation. Upon reading it, I certainly would have thought you had made a mistake!! Somewhat the same reaction I had in the 1960’s as a high schooler, when reading McTeague, by Frank Norris (made into the classic silent film Greed) , in which one of the characters uses the expression “Outta sight!” in pretty much the same way as I would have done in those days. Obviously the novel, written in 1899 and set in the then-present, was not about the San Francisco of the Summer of Love, but about the pre-Quake/Inferno San Francisco of its day, and yet a character used a phrase with which I was familiar, to mean what I would mean by it– talk about speaking to us through the ages! Though I’m about two months late to this rodeo, let me just suggest that, if you haven’t ever done so, read McTeague to get an idea of late-Victorian life in the Bay Area as seen from Norris’s perspective.